Sometimes things come together perfectly and sometimes they don’t, but often it’s a little bit of both. That’s exactly how I feel about these Chocolate Hazelnut Cappuccino Brownie Bites. The flavors and final product came together perfectly, even if there were bumps along the way. Well, maybe it was just one bump. But it was a pretty big one… I’ll start from the beginning. Several months ago, Crusaders Jenn, Elisa, and I bought tickets for Wicked Divas with Stephanie J. Block and Julia Murney at Wolf Trap in Vienna, VA. Last summer, we saw the fabulous Idina Menzel at Wolf Trap and had seats about three rows back. While sitting that close is amazing, part of us envied the concert-goers who were spread out on the lawn with blankets, wine, and tons of food, so this year we decided to do the same. In the weeks leading up to the concert we began discussing who should bring what. I volunteered to bake something sweet because it’s been FOREVER since I last baked—April to be exact—and I already had the perfect dessert in mind. I had everything I would need to pull this recipe together. 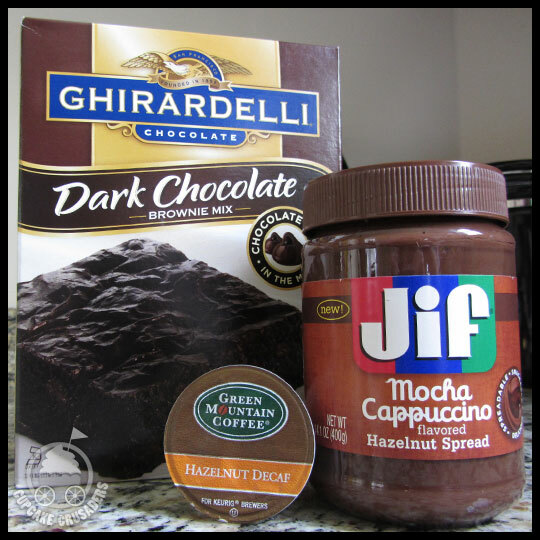 The Jif Mocha Cappuccino Hazelnut spread was purchased on a whim using a coupon, knowing that at some point it would be great for frosting, and the brownie mix was one of those “I need chocolate” moments while walking down the aisle at the grocery store. Don’t act like you haven’t been there before…We know you have. These two items were sitting in my pantry begging to be combined. 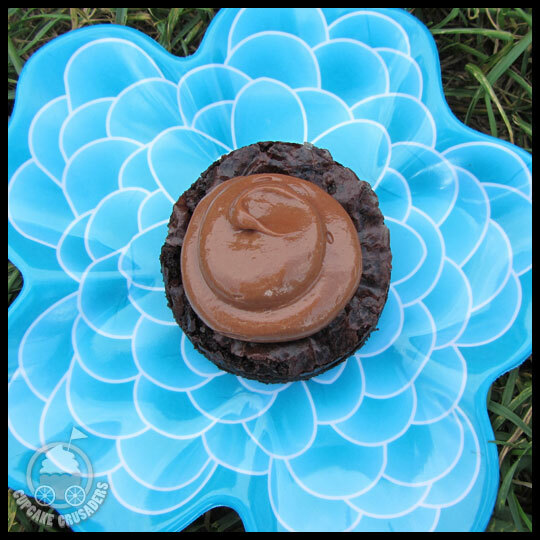 Initially, I intended to make a dozen mini brownie “cupcakes” topped with chocolate cappuccino hazelnut frosting, in addition to a square dish of plain classic brownies. After tasting the batter (I replaced the water in the recipe with hazelnut coffee) I thought these mini brownie cupcakes would be perfect, but I still had to bake them, and that was where my recipe went askew. I severely overestimated the baking time. They didn’t burn, but once they completely cooled, they were solid like rocks. I couldn’t even get the baking liners off and I’m pretty sure they would have broken our teeth. Determined to make this dessert work, and with a square dish of perfectly cooked brownies, I moved on to the frosting. 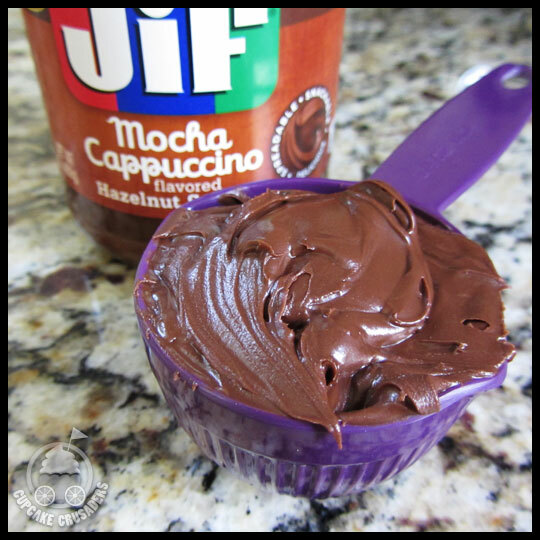 I started by searching the internet for a Nutella frosting recipe (since this Jif spread is basically a knock-off version) and found that I had a decision to make: buttercream base or cream cheese? Not being able to decide on my own, I called my reinforcements (AKA: Crusader Jenn or Elisa…which ever answers the phone first). I told Jenn I was leaning towards cream cheese because I thought it could be interesting, but that I was also worried it might taste weird. Her response was, “Would you eat Mocha Cappuccino cheesecake?” My answer, “Ummm…hell yeah!” It was decided then: cream cheese. I found a recipe on the blog Can You Stay For Dinner that seemed very simple, which of course I love, and the blogger, Andie, seemed to really like it. The only ingredients required were cream cheese, hazelnut spread, powdered sugar, and milk. One thing I did differently—something I’ve never done before—was sifting the powdered sugar before mixing it with the other ingredients. It made a HUGE difference. 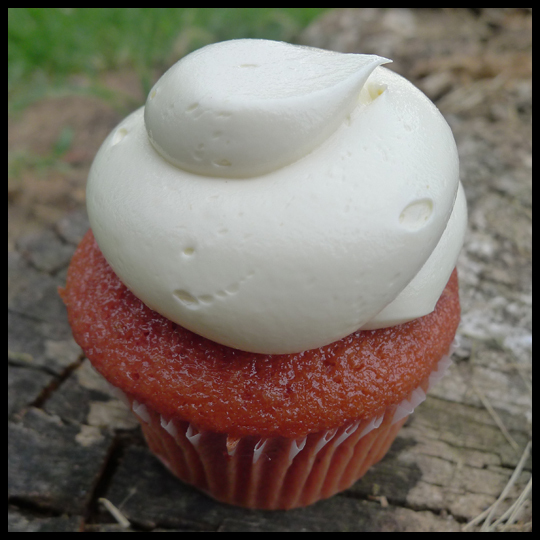 The frosting was so smooth and creamy, and the cream cheese gave the flavor a good balance that wasn’t too sweet. While making the frosting, I had time to process the fact that my cute little mini brownies were a no-go, and instead decided to use a cookie cutter to shape the remaining brownies into individual sized circles before topping with frosting. Even though the brownie bites didn’t turn out exactly as I planned, the end results were still amazing. The mini cakes looked fancy on our new flower plates (birthday gifts from Elisa) and I’m sure we made a few people around us wish they were a part of our picnic. It was the perfect dessert to share with two of my favorite ladies while sipping wine and listening to the sounds of the symphony accompanied by two great Broadway performers. 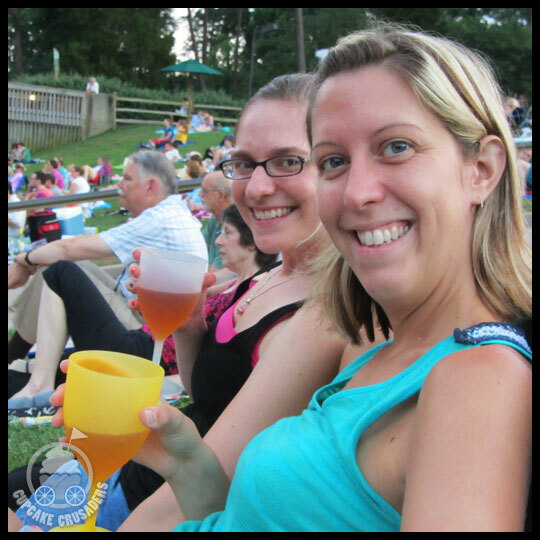 Part 3: Cupcakes + Wolf Trap + Idina Menzel = Perfect Night Out with Cupcakes from Cupcakes! As Crusader Jenn and Crusader Stacy said in their posts the past two days, we all adore Idina Menzel. My adoration only began because they introduced me to her and I thank them, because she is amazing… but enough about her talented self and onto more cupcakes. Crusader Stacy and I made two stops before meeting up with Crusader Jenn and Guest Crusader Ashley at Wolf Trap for the concert. Our second stop was Cupcakes! in Vienna, VA. 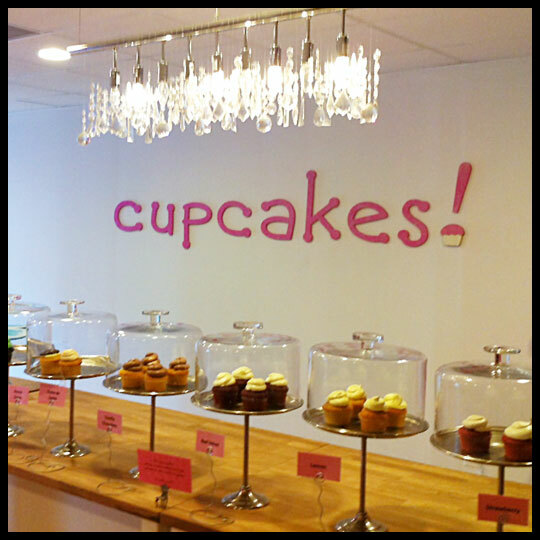 Located in a cute little shopping center, and upstairs from an eclectic gift shop, Cupcakes! was the perfect spot. Cupcakes! boasts a lovely cupcake display with a variety of flavors to choose from, but they also have cupcake related gifts and gift items. Stacy went home with a new cupcake stand that has to be the most perfect little mini cake stand ever made. The staff were very helpful and sweet, explaining that they bake fresh every day and that the cupcakes are moist and flavorful, while the frosting is just sweet enough. They are just lovely; great customer service is never wasted on the Crusaders, we really appreciate it, as it can be hard to find. Moist cake with smooth frosting that embodied Dolce de Leche. It’s a tough flavor to begin with, as it is sweetened milk that is heated and reduced down to an almost caramel type consistency, but Cupcakes! nailed it. The cake alone was lacking a little in flavor, but with the frosting and spot-on texture, all together it created perfect harmony. We liked this cupcake, and agreed its decoration was simple, but cute. Two words: Strawberry CAKE. The staff told us that they use fresh strawberry in their cake, instead of using the strawberry in the frosting – we all thought this was brilliant! This allowed the strawberry flavor to shine, while the frosting wasn’t overly sweet. (I find fruit frostings to be on the sweeter side because you have to add more sugar to keep it stiff.) All of us enjoyed this cupcake, but I have to say that it was my favorite of the day and makes my list of top 5 cupcakes I have ever eaten. Just thinking about it makes my mouth water. Our experience with Cupcakes! could not have been better. Friendly staff and fantastic cupcakes, who could ask for more? Its only downfall is that it is so far away from Baltimore – because I wish I could go once a week for my strawberry cupcake fix. Whenever any of the Crusaders are in the Vienna, VA area we will have to stop into Cupcakes!. I will say though that the concert was fantastic, as always. She sang amazing songs, told some great antidotes, and even encouraged lots of audience participation. But, you probably want to hear more about the cupcakes now, right? Crusader Elisa and I decided to stop at two locations since they were both almost on our way to Wolf Trap. 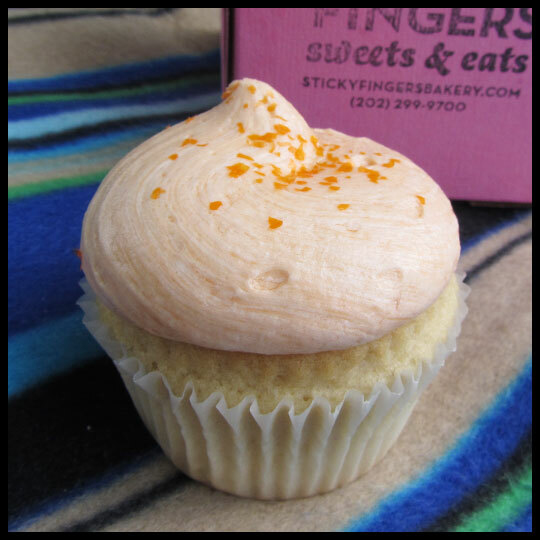 Our first stop was at Sticky Fingers Bakery located in the Columbia Heights neighborhood of Washington DC. 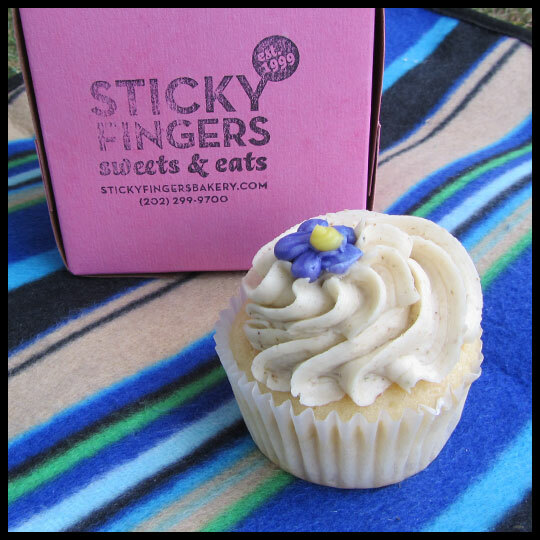 Back in March, Crusader Jenn and I were fortunate enough to meet the owner of Sticky Fingers, Doron Petersan, at the National Capital Area Cake Show’s Cupcake Challenge. Whether or not she remembers, we promised her that we would stop into her shop this summer, and we always like to keep our promises. Upon arriving we instantly fell in love with the decor. With high ceilings and a concrete floor, the space is filled with nods to the 50s and can be best described as retro industrial. From the old fashion refrigerator that serves as a product display and an neat old stove that creates a makeshift coffee area, Elisa and I weren’t quite ready to leave after receiving our coffee and cupcake orders from the attentive staff. Unfortunately we had another stop to visit before meeting Crusader Jenn and Guest Crusader Ashley, so we had to leave after spending just a few minutes there. Elisa and I decided that trying the Orange Creamsicle and the Lavender Lemon were absolutely necessary. The bakery, which sells all 100% vegan goods, was serving many cupcake flavors that day, but Elisa and I like to be adventurous so the Lavender Lemon was an easy choice. The lemon flavor wasn’t very strong in this cupcake, but was present enough to balance out the lavender flavor and keep it from tasting like soap. That is often a reaction we hear from people when they encounter lavender in their food, but for the Crusaders, we didn’t think this tasted like soap at all. The cake was a bit crumbly though. It wasn’t really dry, but the texture isn’t what we would normally expect in a cupcake. Maybe this has something to do with vegan products? We’ve only tried vegan baked goods a couple times, so we really aren’t experts on what to expect from the texture. Next, after taking in all the flavor options, we finally chose the Creamsicle, knowing it would be the perfect addition to a summer pre-show picnic. Our first reaction from this cupcake was, “OMG. THE FROSTING IS AMAZING!” I think I could have easily eating an entire gallon of it. Elisa called it “dreamy” and I couldn’t agree with her more. The cake was also crumbly, similar to the Lavender Lemon, but that frosting easily saved this cupcake and left me wanting a whole one for myself. Even though the cake texture wasn’t our favorite on each of these cupcakes, I would love to go back, sit in one of their shiny pink vinyl chairs, and enjoy another cupcake and delicious cup of coffee. The flavors made these cupcakes ones I think anyone would keep going back for. 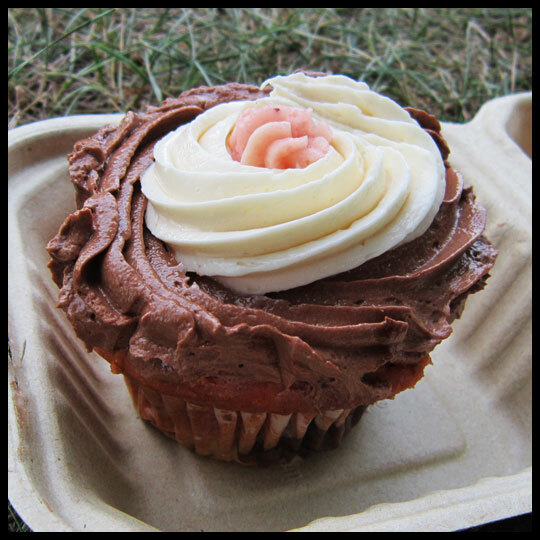 Tomorrow we’ll share our last review from our Wolf Trap cupcake tailgating tasting, so stay posted! 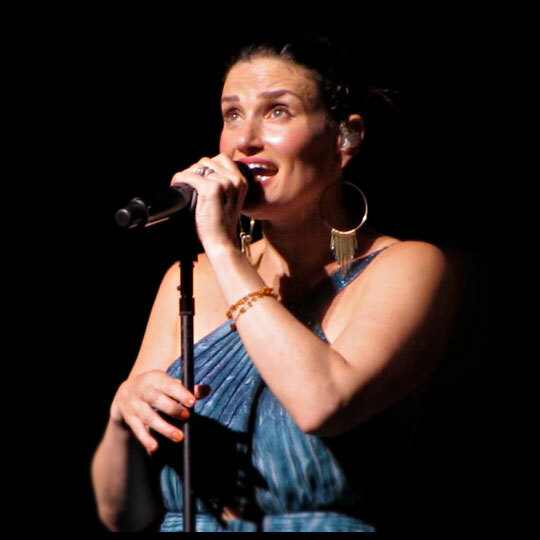 It’s no secret that the Crusaders are theater geeks and, as such, we of course have a favorite Broadway performer: Idina Menzel. 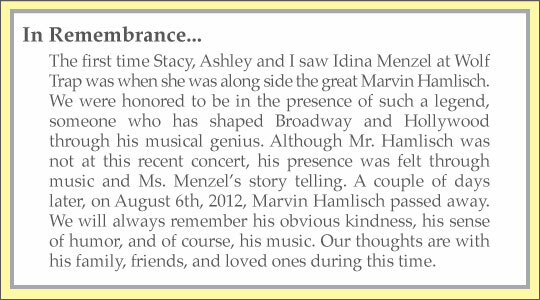 Some of you may know her as the woman who originated Maureen in Rent, others from Elphaba in Wicked. However, it’s not only her Broadway resume that has given her the title of favorite performer for the Crusaders. She is also an amazing songwriter and we love her solo albums. 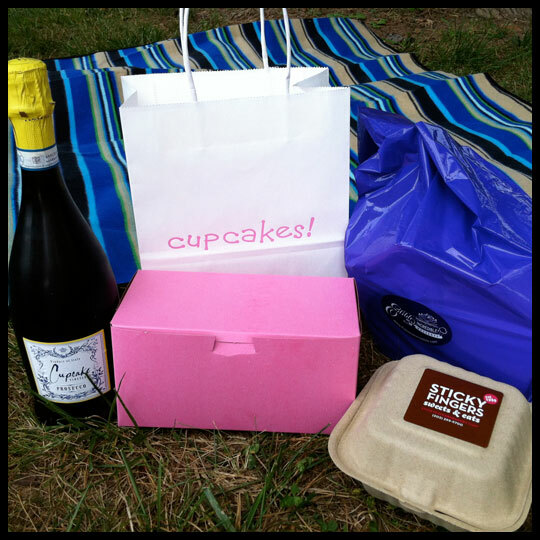 When we found out she would be returning to Wolf Trap (Vienna, VA), we thought there would be no better way to spend the day than to pick up cupcakes from bakeries nearby, and arrive early to picnic in the grass. Any time we can combine theater with cupcakes is a good day for us. Guest Crusader Ashley, who is also an Idina fan, visited for the weekend to attend the concert with us. She had visited Edibles Incredible (Reston, VA) with family the month before. Since it is only 15 minutes from Wolf Trap we thought, what better place to go? 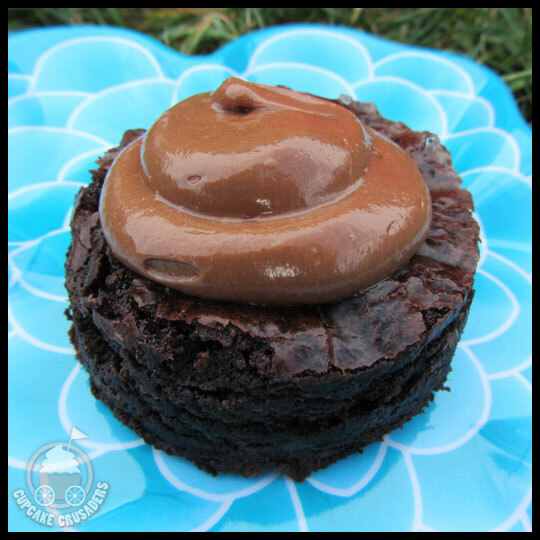 Edibles Incredible caters to more than just cupcake lovers. They also sell whole cakes, chocolates, fudge, gift baskets, specialty and wedding cakes. One of the things that surprised me when we walked in was the size of the cupcakes. Ashley hadn’t adequately warned me that they are the large ones, right on par with Snickerdoodles Bakery (which we have reviewed a few times) and can easily feed two people (the cupcakes are priced at $3.95, which is understandable with the size). 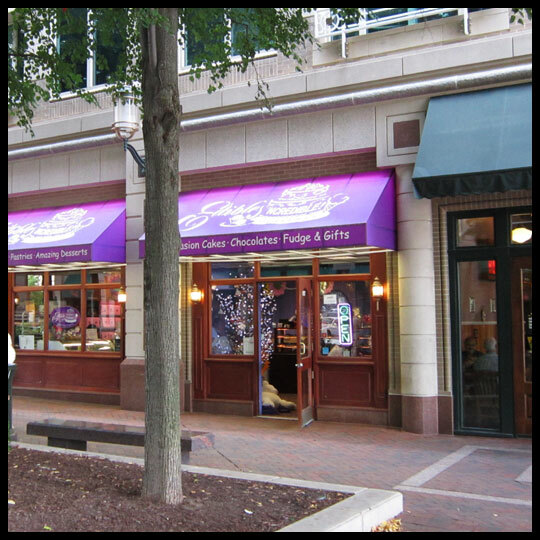 The shop is located in the Reston Town Center, which ended up being perfect for Ashley and I. It’s a great outdoor shopping area, so we were also able to grab dinner. If we had more time, it would have been nice to sit outside and eat dinner and a cupcake, but concert parking was a priority for us, so we grabbed our food and were on our way. Our cupcakes were uniquely packaged in Chinese food containers. While this is a creative idea, it doesn’t bode well for the cupcakes. There is a paper “lift-strip” but with cupcakes so large, and the strip not always landing perfectly under the cupcake, it doesn’t help very much. We really like to have our cupcakes coming out of their packaging perfect, or nearly perfect, looking. The cupcakes at Edibles Incredible were already a little messy looking in the display case, and these containers just made the frosting worse. 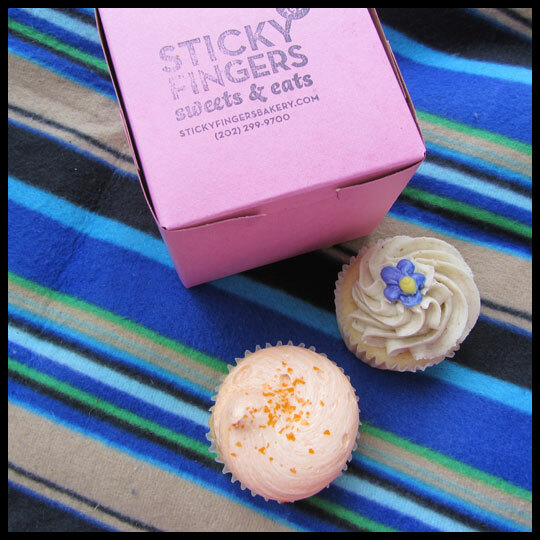 Aside from liking our cupcakes pretty, trying to get them out of the container just made a sticky mess of my fingers and hands…not cool when you are on a blanket and eating outside! 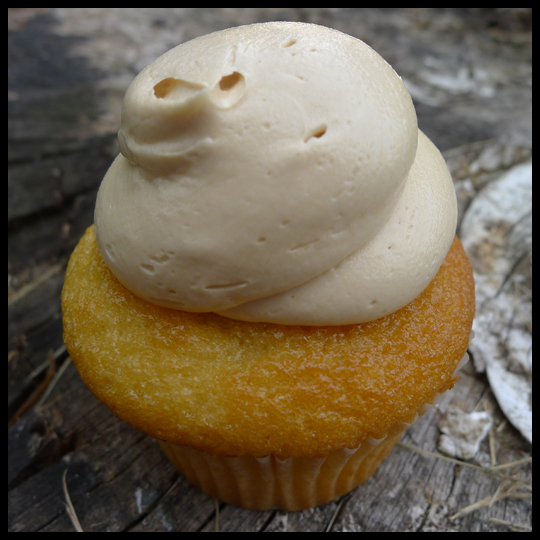 The first cupcake we tasted from Edibles Incredible was the Butterscotch Baby. When Ashley and I saw the description we had to have it: butterscotch cake, with caramel buttercream frosting, filled with caramel, and topped with homemade toffee candy. This was our favorite of the two we purchased, although still not the best. The caramel filling was like a chewy caramel and the cake tasted like Duncan Hines’ yellow cake mix. Because it was richer, denser, and moister than a box mix, Crusader Stacy and I actually really liked the cake. But Crusader Elisa was disappointed and wished she could taste the butterscotch the cake was supposed to have. Ashley and I also decided to purchase the Neapolitan cupcake for all of us to try. It had a little bit of everything, including a marble strawberry, vanilla, and chocolate cake, strawberry filling, and topped with the three different buttercreams to mimic the ice cream. Us Crusaders recently had a great Neapolitan cupcake from IcedGems, so I was hopefully we’d be getting something that fell into the same category. Unfortunately the cupcake was overly sweet, and no particular flavor came through, even when trying parts of the cake separately. The filling, which was similar to strawberry jam, seemed out of place and overpowered the cupcake. Although the cake was moist, it wasn’t enough to save this treat. 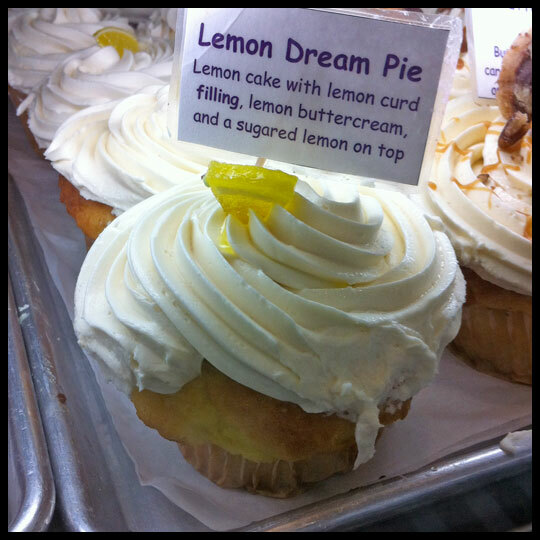 We passed on the Lemon Dream Pie during this trip because Ashley had tried it on her previous visit. It looked and sounded very good (you all know we are suckers for curd fillings), but Ashley informed me that, although she liked the overall flavor, the cupcake was very sweet for her taste. 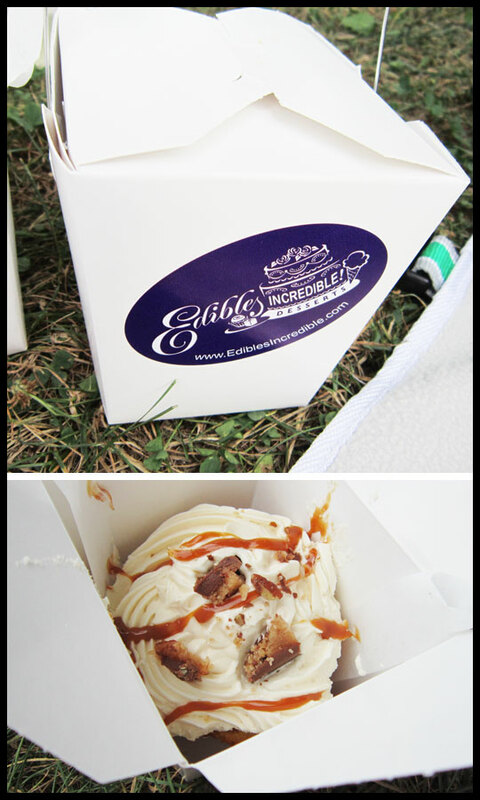 I’ve been trying to decide if I would give Edibles Incredible’s cupcakes another chance. I think that I would. The one unifying factor was that they all had moist cake, and that’s one of the most important things to me. Flavors seem to be hit or miss, but having only tried two myself, I’m curious to see how some others stand up. 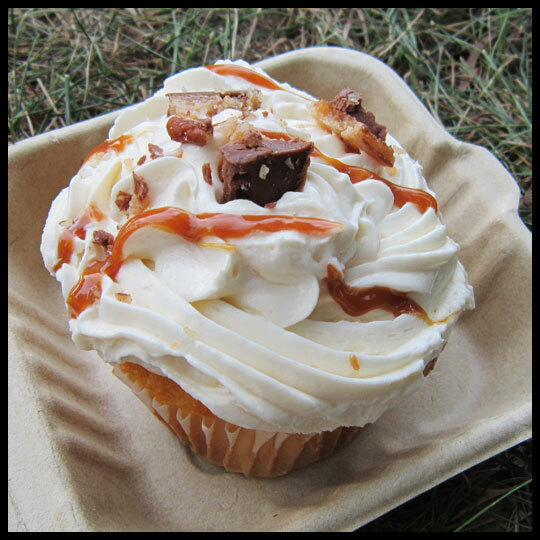 This week we’ll bring you more reviews from our Wolf Trap cupcake tailgating tasting, so stay posted!